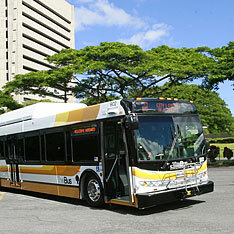 A community meeting on the proposed Alapai Joint Traffic Management Center and Bus Transit Center will be held from 6 to 8 p.m. Jan. 17 at the Mission Memorial Auditorium, 550 S. King St., next to Honolulu Hale. The project site is at the existing Alapai Express Bus Terminal on the corner of Alapai and King streets. The city Department of Transportation Services will present a brief overview of the proposed center and use the remainder of the session for discussion. The city's first Earth Month Pollution Solutions Teen Video and Photography Contest is open to students from nine Leeward and Central Oahu middle and high schools. Students will produce 30-second television spots aimed at preventing water pollution from entering storm drains and streams, and also preventing soil erosion and trash. The contest is intended to encourage teen filmmakers and photographers to promote meaningful water pollution prevention activities that benefit their communities, a city news release said. Deadline for submissions is Feb. 1, and winners will be announced March 1. The winning videos will air on KHON-TV March 21 through April 30. Contest details can be seen at www.cleanwaterhonolulu.com/storm/news/contest.html. Lockheed Martin presented a $25,000 check to the University of Hawaii's College of Engineering to renew a partnership agreement, the university said in a news release. The money will help pay for guest lecturers for classes, clubs, meetings and seminars, and other programs at the UH-Manoa College of Engineering. "Many of the engineers currently employed by Lockheed Martin in Hawaii are UH graduates, and we will be recruiting many more as we continue to grow our business here and the Pacific," said Reid Shizumura, engineering manager for Lockheed Martin Integrated Systems & Solutions in Hawaii. "This agreement through the Industrial Affiliates Program will foster technological and scientific innovation at the university and strengthen the local engineering talent pool." More than three-quarters -- 76 percent -- of the people who responded to a recent survey commissioned by the Honolulu City Council said they have never attended a neighborhood board meeting in the last year. Of those who have attended, 65 percent said they were either somewhat dissatisfied or very dissatisfied with their experience, according to the survey results that were released this month. "It's not good," Neighborhood Commission Executive Secretary Joan Manke said of the survey results. The results come on the heels of a report by the city auditor released this summer critical of the operation of the neighborhood board system. The Council appointed a task force to address the deficiencies pointed out in the audit. Manke believes a more aggressive campaign to educate the public on the Neighborhood Board system and recruiting more interested candidates will address some of the negative results of the survey. 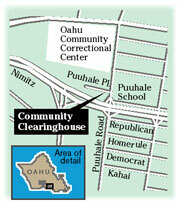 Elections for all 444 seats on Oahu's 32 neighborhood boards will be conducted in March and April. Candidate application forms are available at the city clerk's office and the Neighborhood Commission offices at Honolulu Hale and Kapolei Hale, and all satellite city halls. The deadline to file is Jan. 16. Big Island businessman and philanthropist Uncle Billy Kimi was honored by the Rehabilitation Hospital of the Pacific at a recent ceremony at its Kailua-Kona clinic. Kimi, known for Uncle Billy's Hilo Bay and Kona Bay Hotels, and his brother Richard, founder of the Sand & Seaside Hotel chain, donated $10,000 to the REHAB clinics in Kailua-Kona and Hilo. A portion of the funds was used to purchase Genisys Ultrasound/Electrical Stimulation Units for physical therapy. The machines produce ultrasound, heat and electrical stimulation. They can be used for pain, muscle weakness, joint tightness and muscle spasms, among other problems. Billy Kimi also pledged $6,000 to provide each machine with a cold-laser attachment used for soft-tissue injuries and musculo-skeletal inflammatory conditions. » A team from Hawaii Pacific University took top honors in the Hawaii Site Championship of the Association for Computing Machinery's Pacific Region Programming Contest. The computer science undergraduates placed 10th out of 69 teams. » Zhong Xiang Zhang, a senior fellow at the East-West Center, was appointed co-editor of the International Journal of Ecological Economics & Statistics. This is his eighth appointment to boards of leading international journals. The Medical Examiner's office identified a Honolulu man who died yesterday following a motorcycle crash Saturday night as 22-year-old Timothy Yomes. Police said that at about 10 p.m. Saturday, Yomes was driving a red 1999 Yamaha R-1 motorcycle Waianae-bound on the H-1 freeway when the motorcycle hit a guardrail near the Middle Street overpass. He was thrown from the bike and suffered critical head and internal injuries, police said. Emergency rescuers took Yomes to the Queen's Medical Center, where he later died. Police said Yomes was wearing his helmet and that speed might have been a factor. An electrical short-circuit caused a fire yesterday that damaged thousands of dollars' worth of communications equipment at a Coast Guard lighthouse storage shed at 3399 Diamond Head Road, a fire official said. The fire started at about 7:54 a.m. in a ceiling light fixture, said fire Capt. Sigmund Oka. Damage was estimated at $10,000 to the structure and $50,000 to its contents, Oka said. Police arrested a woman who allegedly stole from a Haleiwa supermarket yesterday. They said she tried to leave the store with merchandise she had not bought. When an employee confronted her outside the store and asked her to pay for the items, the woman refused and then hit the employee, police said. She then fled in a truck. Police found her later and arrested her for investigation of second-degree robbery. Police arrested a 22-year-old man who allegedly stabbed another man in the hand with a kitchen knife on Christmas Eve. Police said the incident happened at about 9:30 p.m. in Waipahu, but did not provide further details. Police arrested him on suspicion of second-degree assault.